Early Thursday morning, two explosions generating billows of thick black smoke were reported at a flooded chemical plant in Crosby, Texas, just 30 miles northeast of downtown Houston. No one was on-site at the time of the blasts; Arkema Inc., one of the world’s largest chemical companies, had already ordered workers to leave the plant, which had been inundated by more than 40 inches of rain in the wake of Hurricane Harvey. Harris County officials also ordered the evacuation of residents within a 1.5-mile radius before the explosions took place. The unprecedented flooding overwhelmed the plant’s primary power source as well as two sources of backup power, causing the facility to lose refrigeration. This is critical for organic peroxides – compounds used in making pharmaceuticals and construction materials – which burn if not stored at a low temperature. “We want local residents to be aware that the product is stored in multiple locations on the site, and a threat of additional explosion remains,” the company added. 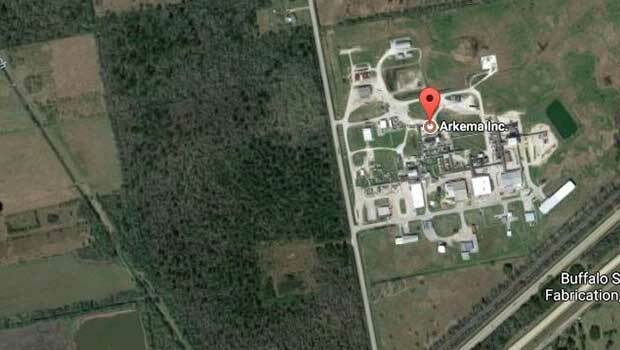 Arkema spokesman Jeff Carr said the chemicals being released into the air are not dangerous to people, but smoke – similar to that of a large campfire – may affect some. Sheriff deputies went to the hospital after inhaling fumes from the explosions, but some were later released.